Although PhD students have much greater freedom to explore alternative ways of doing their dissertation research and presenting what they have learned, I suspect the academy is still pretty conservative overall. This conservatism no doubt has a number of sources, including the comfort level of faculty, the bureaucracy of creating dissertations, and even the views students bring to the dissertation enterprise. Students can be the source of inspiration though and there have been a couple notable examples, of late. Another example is Nick Sousanis’ (pursuing a doctorate in interdisciplinary studies at Teachers College) comic-book format dissertation. Unflattening: A Visual-Verbal Inquiry Into Learning in Many Dimensions is what it says it is, an investigation of the interconnectedness of the visual and the textual and that interconnectedness’ relationship to learning, and Sousanis blogs about his progress here. To explore the relationship between perception and visual strategies, he depicts his dog navigating a forest at night using a range of senses to perceive. 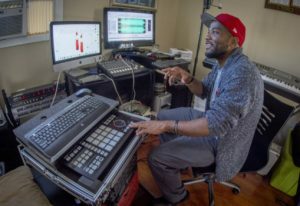 And recently, Clemson University doctoral student A.D. Carson produced a rap album for his dissertation. The album, “Owning My Masters: The Rhetorics of Rhymes and Revolutions” uses hip-hop to explore such ideas as identity, justice, economics, citizenship and language. Writing in hip hop Carson isn’t being gimmicky but rather communicating in a way that is natural and embodied for him and complements the content of his work. I’m trying to examine how an authentically identifiable black voice might be used or accepted as authentic, or ignored, or could answer academic questions and be considered rightly academic. So I have to present a voice rather than writing about a voice. These are examples of what might be a trend, a move away from traditional book and article formats as the only representations of knowledge, but the change comes at a glacial not a volcanic pace. The next several decades may expand and complicate the notion of representation, but in all this one hopes the focus on form, while integral, does not diminish a focus on quality (whatever that may end up meaning). Can filmmaking deepen and broaden the scope of rigorous scholarship? On June 27, 2016, Joel Bakan, Phillip Vannini and Charles Menzies discussed this question. 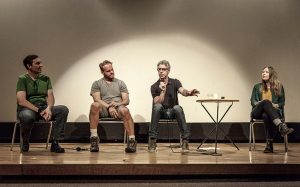 Organized by UBC’s Public Scholars Initiative, three faculty who incorporate filmmaking into their research discussed the synergy between academic and artistic forms. Camilo Jose Vergara’s project Tracking Time is a repository of images of poor, urban American built environments. Returning year after year, Vergara photographs the same buildings and streetscapes to chronicle the transformation of the built environment, transformations that often illustrate decay but sometimes redemption and revival. Vergara’s project illustrates a critical source of sociological understanding of human nature by chronicling the spaces humans create, inhabit, and reinvent. Urban life is, of course, revealed in the faces and stories of people, but equally in the bricks and streetscapes created by those people. 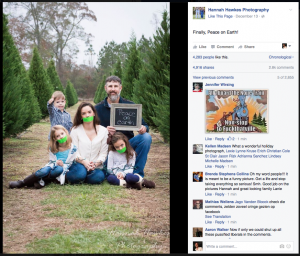 This image, a family photograph, taken by Hannah Hawkes Photography has gone viral. Mostly people are outraged. The image is a disturbing one, to be sure… a mother and her daughters with their mouths taped shut and bound with holiday lights while the father and son smile, declaring “peace on earth” and giving a thumbs up. Why the outrage? Seems the family requested the picture and the photographer accommodated their request. What the family’s motivations were is unknown, as is often the case with images. Often the photographer’s intentions are also unknown, but in this case Hannah Hawkes decided to reveal her intentions/interpretations of the photograph. She thought it was humorous, a joke, and her subsequent post made this clear. After being silent, now isn’t that ironic, I would like to speak! 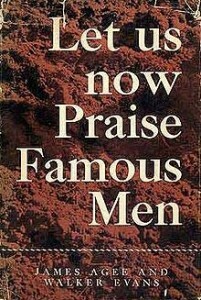 I have been called every name in the book, and have received some very hateful and vulgar comments and messages. I would like to say that as a female I do NOT and have never promoted violence to women! I do not support abuse, or the degradation of women. My controversial photo was taken by request by the family, and was in no way meant to promote abuse. This photo was taken with humor in mind, and was meant as a comical Christmas photo. I personally know this family, and have known them for many years. They are not abusive to their children in any shape or form. Also, I would like to add that no one was harmed during the process! So everyone have a very MERRY CHRISTMAS and MAY GOD BLESS you and yours! So, the outrage depends on the context… a family photographer who takes pictures her clients want taken, but has seemingly little awareness of the meaning of what she is doing. Given that, the outrage makes sense. Viewers see this image as misogynist because both those being photographed and the photographer lead us to a literal reading of the image. Put this same image in other contexts, say an arts based investigation of gender relations, and the image turns from disgusting and outrageous to powerful and evocative. In the first instance the image promotes the subjugation of women, in the second the image reveals that subjugation. This revelation is powerful because of the juxtaposition of middle class bucolic family imagery with the silencing and restraint of women alongside the freedom of men. The family image punctuates the message by focusing on the inter-generational perpetuation of women’s subjugation… the young boy’s grinning thumbs up reveals the arrogance and smugness of the power men feel they have/have over women. Yesterday, The Guardian published a story titled The Year in Sexism: How Did Women Fare in 2015? and the bottom line is not so well. That story didn’t go viral, and fewer people were outraged… but the messages in the story and this image are consistent and complementary. Images compel emotional responses and we can use them both to learn about social phenomena (like family, gender relations, southern cultural norms, and so on) and to communicate about social relations. The literal intention of the family and photographer, the support for the photograph expressed in comments on the FB page, the outrage of media outlets, and the image as found data all speak to the power of images in human experience and understanding. Powerful, never simple… never literal in what they may reveal. Consider this strategy suggested by Ali McCannell, a UBC graduate student ~ if you want to know what matters to people in a particular community, city, country visit a convenience or corner store and see what’s for sale. Her example was from her time spent teaching in Korea where she noted the following commonly available items in pretty much any small shop: “grooming items, booze, double eyelid tape, a huge selection of yogurt drinks, kimchi and worm larvae.” I won’t speculate on what that list might mean, but at first glance it speaks volumes. What’s in your corner store? People’s stuff can be interesting and useful in a range of research methodologies. 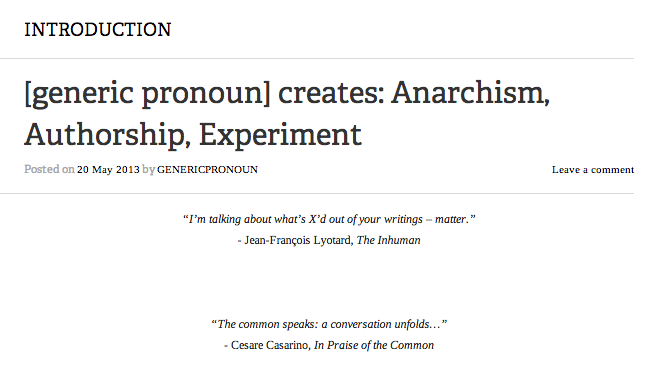 For example, in narrative research one might collect and analyze stories but look also to people embedded in their environment, including how they talk about it. 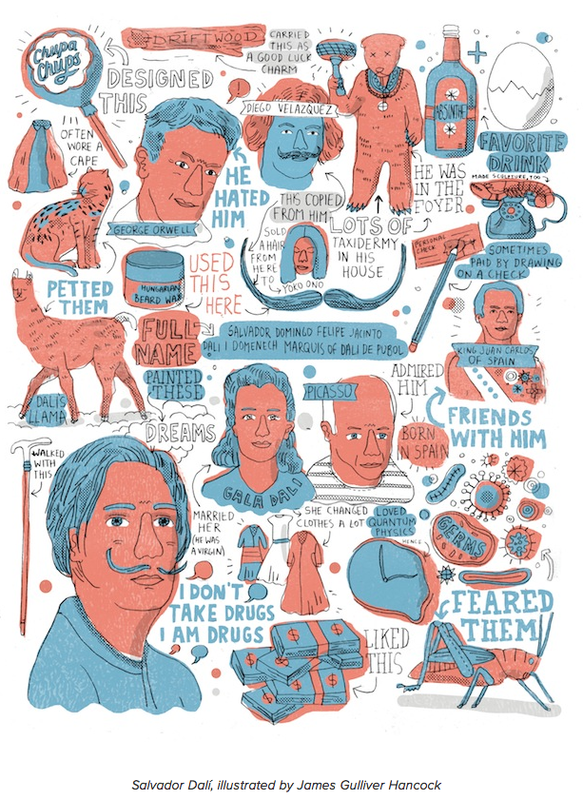 Although not social science per se, a new book Artists, Writers, Thinkers, Dreamers: Portraits of Fifty Famous Folks & All Their Weird Stuff illustrates such connections. While this book is more a novelty, it does illustrate the interconnections between people and the things they use, surround themselves with and value. 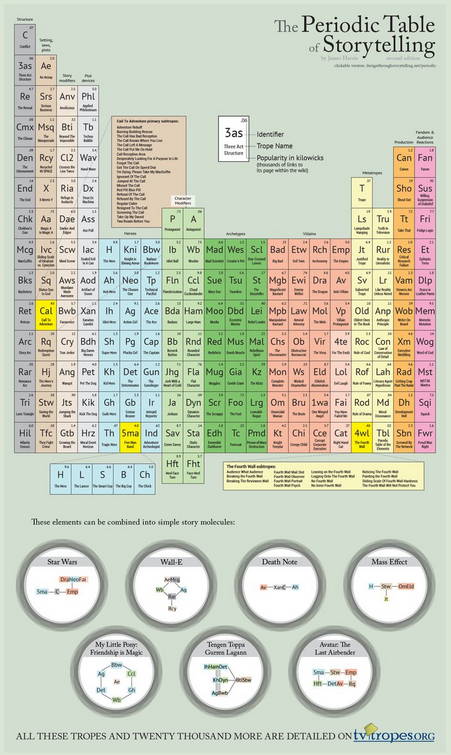 It gives us an idea of how to think about objects in relation to social meaning of lives and equally important it illustrates how those connections might be represented beyond text based descriptions. Photo essays have been around for a long time ~ they are a series of photos, sometimes with captions, descriptive and/or explanatory text. Usually photo essays illustrate something that is more immediately knowable through an image, often by evoking an emotional response, but often also by showing. A photo essay structures a collection of images either in a specific order to illustrate the progression of events, emotions, and concepts OR thematically to illustrate concepts. Photojournalists and photographers create photo essays and intuitively portray lived experiences; social scientists create photo essays and explicitly explore and represent lived experiences. One isn’t better than the other, and they are often indistinguishable.Some photo essays are only images, such as Walker Evans and James Agee’s classic work Let Us Now Praise Famous Men. Photo journalists use this form of representation to report on events and experiences around the world. 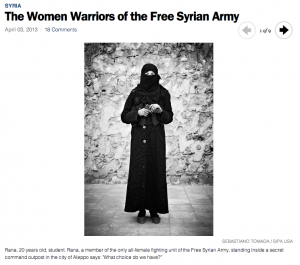 This example of Syrian women who have taken up arms captures a single idea poignantly. Photographers, like Lauren Greenfield, uses images to illustrate our own culture, especially youth culture in America. In Fast Forward, she captures the contrast between kids growing up in Los Angeles living lives of affluence and poverty, all in a sped up world. 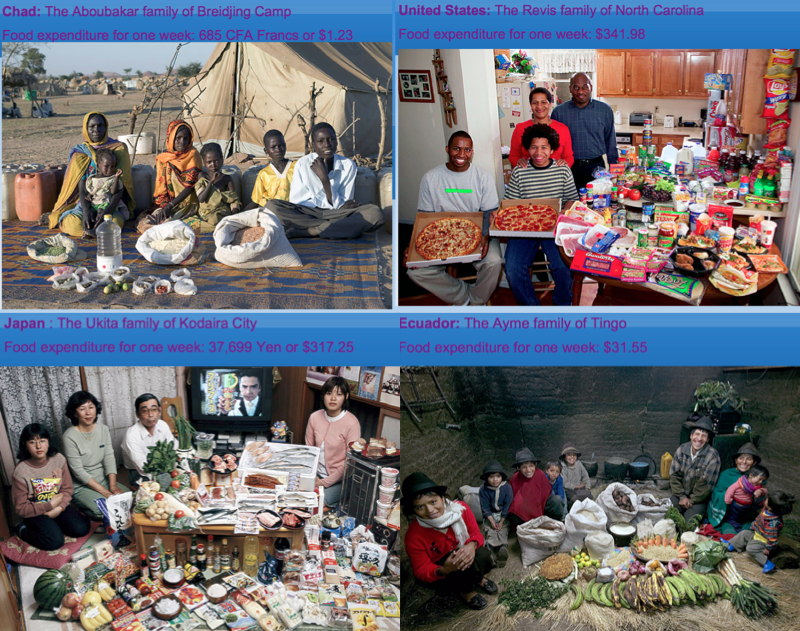 Some photo essays use constructed images to tell a story, as in Hungry Planet: What the World Eats, an essay illustrating how globalization, migration and rising affluence are affecting the diets of communities around the globe by focusing on 30 families in 24 countries. Each chapter of the book features a portrait of a family, photographed alongside a week’s worth of groceries. There are many images of families food shopping, cooking and eating, but the primary images are staged ~ the family in the background, and the food they eat in the foreground. Text describes the details or the week’s food, including the cost of the food. 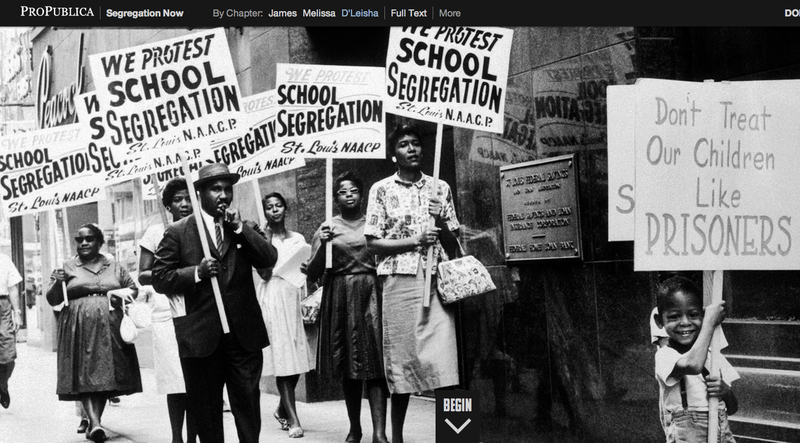 Photo essays can also be collaborations, multiple photographers/researchers working together. 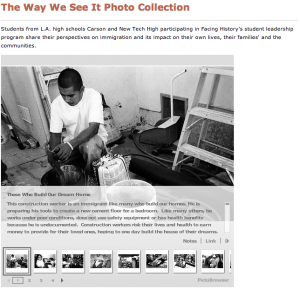 High school students in LA used photography to explore immigration in their communities. Sophisticated uses of media allow for combinations of photographs, texts, and infographics (including interactive formats), a less static form of photo essay. An excellent example of this is Segregation Now, which looks at resegregation of schools in the U.S. south, Tuscaloosa specifically. Tropes are devices and conventions that a writer can reasonably rely on as being present in the audience members’ minds and expectations. On the whole, tropes are not clichés. The word clichéd means “stereotyped and trite.” In other words, dull and uninteresting. We are not looking for dull and uninteresting entries. We are here to recognize tropes and play with them, not to make fun of them… Since a lot of art, especially the popular arts, do their best to reflect life, tropes are likely to show up everywhere. Narrative analysis can be facilitated by looking at the tropes at the centre of the stories we are investigating, and in the section on narrative devices one can investigate a range of possibilities. 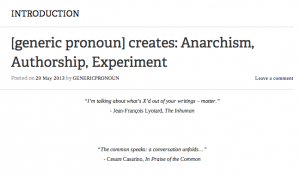 Tropes are named (such as “always need what you gave up,” “dead end job,” “dramatic irony,” “fighting for survival,” “human shield,” “I just want to be normal,” “shapeshifting,” “with due respect”), a short explanation is provided and links to many examples are given. Other sections focus on characters, plot, setting and so on. 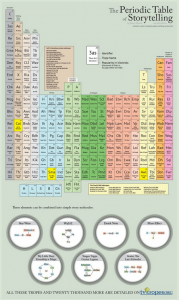 The wiki is a rich resource, every changing, including such gems as the Periodic Table of Storytelling. This post is about food, really about food as a window on culture. It is meant to illustrate how something ordinary can be a powerful analytic construct. So even though this is about food, it’s not really about food, it’s an illustration of an idea. Food is core to all cultures, it is part of the traditions, ceremonies, economics, cosmology, and social structure of any cultural group. On the surface, food is, well stuff one eats. But if that’s all it were then given our particular eco-environment we would eat whatever physically sustained us. Not true. Cultural anthropologists, food scientists, environmentalists, sociologists ~ folks often known as food scholars ~ study food as a window to cultural meanings and values. The Society for the Anthropology of Food and Nutrition is a good place to begin exploring the meaning of food and its complex intersection with every other aspect of social life. Food can be the window to ceremonies , to eating and health (Eating Right in America), to the artisanal food movement (The Life of Cheese), to globalism (Greek Whisky: The Localization of a Global Commodity), to social solidarity (in the allegory of long spoons in many cultures, and Foods, Farms and Solidarity). Where we prepare food matters, and Emily Contois’ Not Just for Cooking Anymore: Exploring the Twenty-First-Century Trophy Kitchen illustrates that kitchens are places where food, as well as social and cultural capital, are produced. Hungry Planet: What the World Eats illustrates how globalization, migration and rising affluence are affecting the diets of communities around the globe focuses on 30 families in 24 countries. Each chapter features a family photographed alongside a week’s worth of groceries. There are many images of families food shopping, cooking and eating, but the primary images are staged ~ the family in the background, and the food they eat in the foreground. Text describes the details or the week’s food, including the cost of the food. And, food and literature are always an interesting combination. A notable example is, of course, Alice B. Toklas’s literary memoir disguised as a cookbook . Instructive as representation is Fictitious Dishes: An Album of Literature’s Most Memorable Meals, in which Dinah Fried cooks and photographs meals from famous fiction. Each photograph is accompanied by the passage in which the recipe or food description appears, as well as a few comments about the respective author, novel, or food. The Philographics: Big Ideas in Simple Shapes is a novel, delightful representation of core ideas in philosophy, many of which underpin the research enterprise. For some folks, the images may capture what otherwise takes volumes to explain. 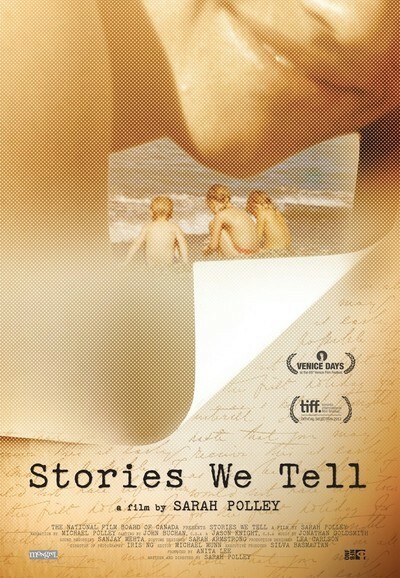 Sarah Polley’s film Stories We Tell is about her mother Diane Polley, or so it seems initially. It is much more than that though. It is an artful alternately weaving and unravelling of narratives of those who share experiences, but, of course, tell their own stories of those experiences. The story unfolds at one level as the story of Diane Polley, a notable Canadian actor (with a daughter who is now both notable actor and director), although the story is more about her personal than professional life. Polley asks each storyteller to “tell the story from the beginning” and she privileges each in the unfolding story that ultimately revolves around the family “joke” that Sarah does not look like anyone else in the family. Individual stories layer and turn back on themselves as that family story becomes a story of its own when Sarah finds out that the man she thought was her biological father is not. Interviews of siblings, friends, spouses, lovers, and children in Stories We Tell are amazingly intimate and artful illustrations of poignant in-depth interviewing based on difficult questions. The movie is family talking to each other. Everyone misses Diane, and each suffers her loss deeply since she died of cancer when Sarah Polley was 11. The answers offered aren’t simple, and Polley’s own movie narrative reveals the twists and turns in her own story, which is more what the film is about. Some reviewers have called it a love letter to her parents. There are fleeting senses from time to time that the story is told, but then it isn’t and by the time the film ends it is clear there is no end to the story. Ever. If one were interested in exploring narrative inquiry as a research methodology, this film is about as good a place as any to begin. It illustrates the tensions of truth-telling versus storytelling. It illustrates that all stories have gaps, omissions, and contradictions and within each of those, another story is being told. It illustrates the complexity of whose story is being told. It illustrates the connections and disjunctures between subjective and inter-subjective experiences. It illustrates the role of memory and reenactment in storying life. It illustrates the role stories play in making sense of experience. It illustrates the deeply emotional meaning of stories. It illustrates the human desire to explore what might well be unknowable.